Control of India at the beginning 18th century is up for grabs. The 200 year-long rule of the Grand Moguls is collapsing, but they still have some power. Now is the time for the Maharishis and princes to take control of the Indian subcontinent. 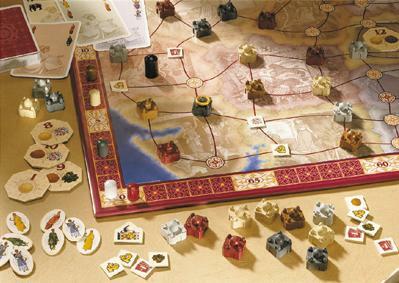 The players use strategy and cunning to win influence over northwestern India, province by province and city by city. The most successful player (and the winner) is the one who establishes the most magnificent palaces and has the most power in the end. This is an excellent and under-appreciated game of area control through bidding. Don't be intimidated by the dry theme, as it's as pasted on as they come. The actual gameplay is really superb, easy to grasp and enjoy, with a lot of depth and replayability. I think this is one of the most perfect Reiner Knizia games -- very elusive, addicting and embraces the theme of balance in dominance. The theme of controliing areas of trade, or religion, or politics, etc., while building palaces around India is, once again, a completely obvious pasted-on theme like many of the Doctor's games. But the mechanisms of how you vie for influence are really sweet and sophisticated for the boardgaming realm. Taj Mahal really should play quicker with experienced players -- and can bog down a bit when laying with new players. And it's definitely suited better in its slightly fiddly scorekeeping for a computer game, yet to own it in all its tangible pieced, human-interactive form is a pleasure for any board gaming afficionado.